Liying Liu obtained her PhD from Northeastern University in 2011. From 2008 to 2011 she was a visitor in the Chemical Engineering Department of Monash University of Australia. She began her academic career as a senior lecturer in Thermal Engineering Department at the Northeastern University of China in 2012 in both teaching and research roles. Now she is an associate Professor in northeastern university. 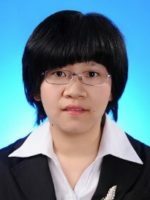 Her research includes synthesis of zeolites from fly ash, synthesis and characterization of novel adsorbents, and waste treatment.